The Basin and Range province is familiar to anyone lucky enough to venture across it. Steep climbs up mountain ranges alternated with long treks across flat basins. This pattern extends from eastern California to central Utah and from southern Idaho to the state of Sonora in Mexico. Within the province, the Earth's crust (and upper mantle) has been stretched up to 100% of its original width. As it expanded, the crust thinned and cracked, creating large faults. Along the trending faults, mountains were pushed up, and valleys carved below creating a distinctive alternating pattern of ranges and valleys. The topography and the dry climate create a number of impressive features and landscapes. These include pediments, alluvial fans, bajadas, bolsons, Inselbergs, playas, mud flats, salt flats, lakes, sand dunes, canyons and the Rio Grande Rift. 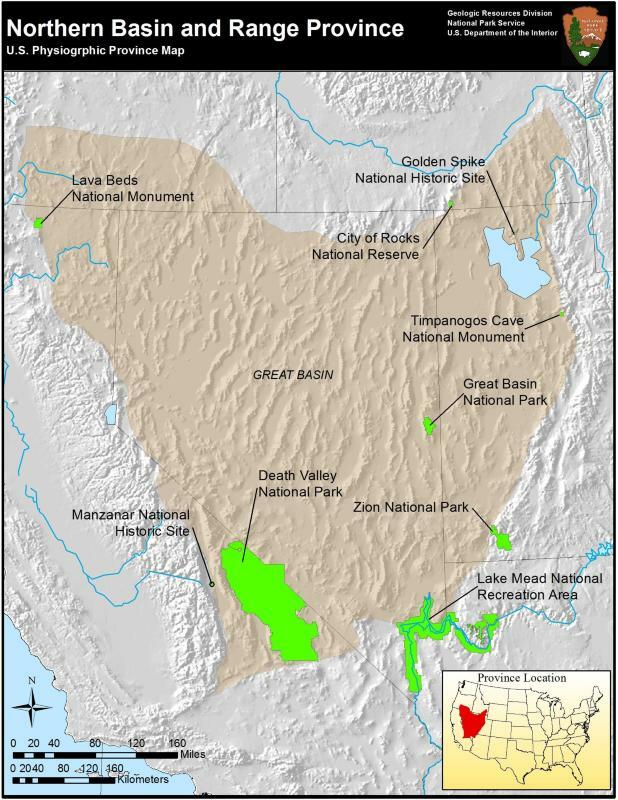 The Great Basin Section comprises the entire northern portion of the Basin and Range province. This section contains a portion of southwestern Oregon, southeastern Idaho, the western portion of Utah and nearly the entire state of Nevada. This section is notable for its function as a "Great Basin", in that virtually no ground water escapes to the oceans. 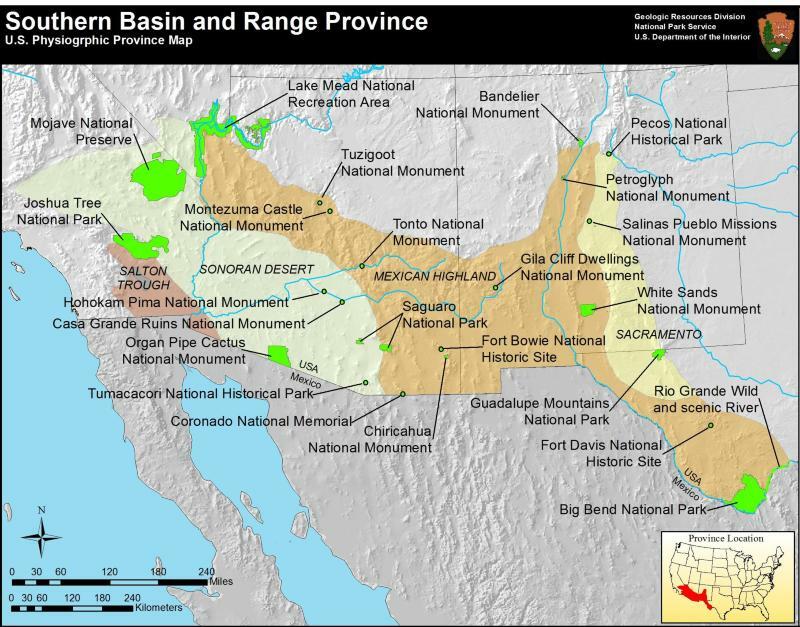 The Southern Basin and Range consists of the Sonoran Desert, Salton Trough, Mexican Highland, and the Sacramento sections. This portion of the province mountains have a slightly lower elevation than those found in the northern part of the province. The Incorporated Research Institutions for Seismology (IRIS) has created an interactive animation and many video animations demonstrating the processes that form the Basin and Range. A worksheet to accompany the animations provides background information and vocabulary for students. Learn more on the IRIS website. In this activity from the Incorporated Research Institutions for Seismology (IRIS), students study geologic cross sections to determine the differences between normal faults and thrust faults and then try to piece together the fault lines. Learn how to make fault-block mountains. Students will understand the geologic forces that form and shape mountains, and more. Read the curriculum on the teachingboxes.org website. Learn more about the geologic history of Lake Mead on the from USGS.